A rain barrel is a container -- usually constructed of plastic or wood -- that is used to collect and hold rainwater for later use. 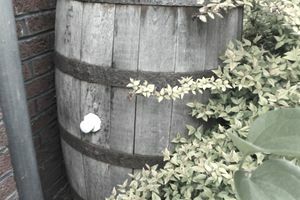 In most instances, the barrel connects to the end of a gutter downspout to collect rooftop runoff. Ready-made rain barrels sell for anywhere between $50-$200, depending on features, but you can make your own rain barrel for as little as $20-$30. When choosing a rain barrel, you first need to determine how much water you hope or expect to capture. Most rain barrels have a 60-gallon capacity, but you can also buy larger barrels, or daisy chain several together to increase your water storage capacity. Regardless of the size that you choose, try to to seek out a model with a mesh screen at the top of the barrel. This will help to filter out debris and prevent mosquitoes from breeding in the water – a worthwhile feature indeed. Also, worth seeking out: a barrel with a built in spigot on the side, so that you can attach a hose or fill up things like watering cans and wash buckets. Captured rainwater can be used to water your yard, indoor and outdoor plants and to wash your car. With some modifications to your plumbing, it can also be used to flush toilets and wash laundry. 1. To prevent injury to children and pets, ensure that the tops of your rain barrels are kept securly in place, and that the barrels can not be overturned easily. 2. Indoor rainwater use is not permitted in all areas. Check with your local government before making any alterations to your indoor plumbing.